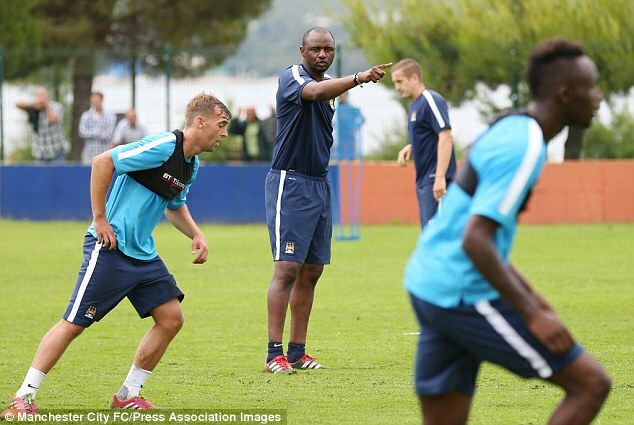 In broiling heat on the western tip of Croatia, Patrick Vieira is demanding that little bit more from his young Manchester City players. Vieira’s proteges, along with the Under 18 group, coached by former Blackburn winger Jason Wilcox, are in the quaint coastal town of Novigrad for a 10-day training camp set against the panoramic backdrop of the Adriatic Sea. ‘We have a motto here,’ Wilcox begins. ‘Great person, great footballer. That means punctuality, appearance, work ethic, respect. You speak to cleaners how you speak to the manager. At the club’s Carrington training ground in Manchester, discipline is instilled in these young men. If they forget an item of kit, whether it be their water bottle or shin pads, they will not train. If they are late for a team meeting on match-day, they will not play. He has endured some injury problems but re-emerged as one of the most exciting talents. Assured as a full back, centre-half or central midfielder, he has already trained under Vieira and played for England Under 16s and Under 18s. A commanding centreback, powerful and composed in possession. As a 15-year-old last season was regular in the the Under 18s defence. Direct and fast with a terrific left foot. In Jason Wilcox has the perfect mentor as a left winger. The son of Andrew, he can operate from the wing or up front. Was excellent in the UEF A Youth League last season. There is a conscious effort to shield these teenagers from the trappings of fame. While adidas are already sponsoring some of City’s English 17-year-olds and agents have free rein to handpick the region’s finest talent, they are also given cookery and driving awareness classes. City are looking to nurture players from the cradle to the gravy train of the Premier League but in the boardroom they recognise that improvement is required. 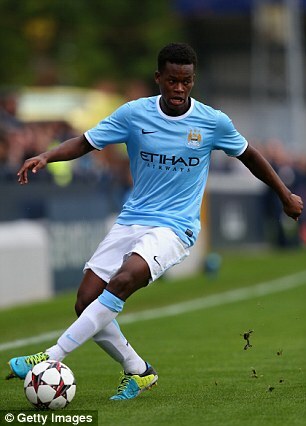 Since the Abu Dhabi takeover in the summer of 2008, no player has graduated from the City academy to cement a place in the first team squad. 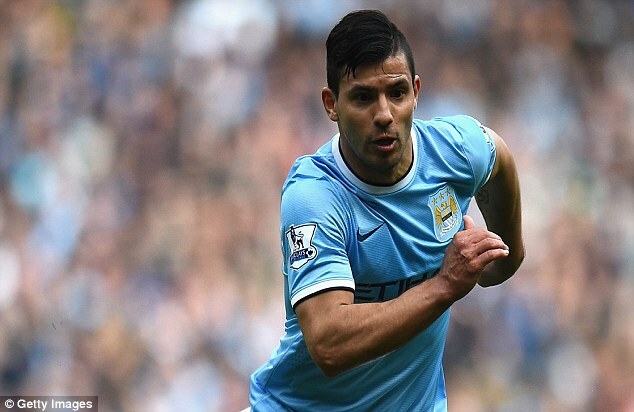 Last September, City defeated Manchester United with 10 overseas, outfield players. English players Jack Rodwell — who signed for Sunderland on Tuesday — and Scott Sinclair started nine Premier League matches between them since signing two years ago. Certainly, the potential is there: 30 of the 46 players in Croatia hail from the UK or Ireland. Light blue is increasingly the dominant colour in many of England’s young dressing rooms. 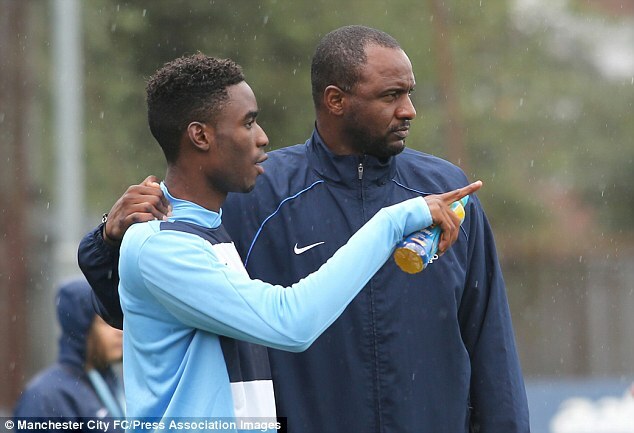 ‘We had seven under-16s in the England squad last year,’ Wilcox reveals. ‘That was a record for us. 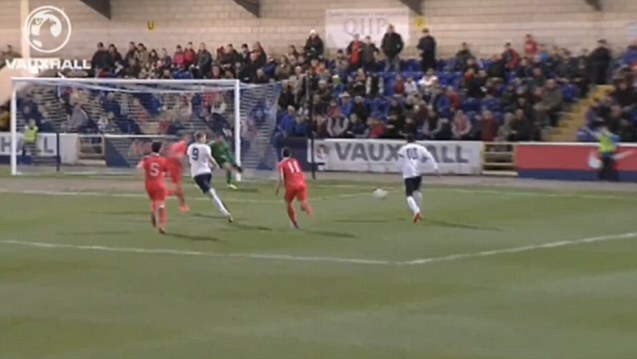 We have some incredibly talented English players. 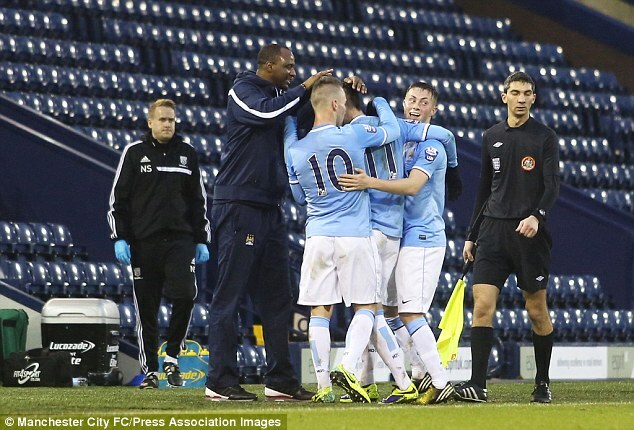 Brandon Barker, Ashley Smith-Brown, Angus Gunn, Kean Bryan, Tosin Adarabioyo. The players are coming through. ‘Below the under-18 group, over 90 per cent of our academy is English. Recently we offered eight professional contracts and six of those are English boys. The seeds of talent are beginning to germinate. Last season, City’s Under 11s and Under 14s were national champions and the Under 18 side were northern league winners. 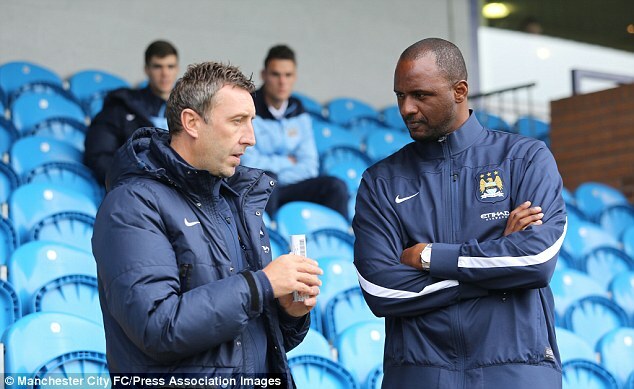 Under Vieira, an Under 19 side reached the quarter-final of the UEFA Youth League. A 6-0 victory over Bayern Munich reverberated around Europe, with five English names on the team sheet. Most are yet to be seen in the first team squad, something Vieira attributes to the ‘massive’ gap between youth competitions and the demands of elite football. It is why City are thought to remain receptive to discussions over B-teams in the lower tiers. As the authorities prevaricate, City are single-minded in their aspiration and little encapsulates the journey from chip-fat to caviar quite like the money and dedication flowing into this academy. Having invested heavily in the first team, securing two Premier League titles in three years, Sheik Mansour is now hard at work on City’s foundations. Later this year, the £150m City Football Academy will open, a stone’s throw from the Etihad Stadium, where Tony Blair once intended to build a Super Casino. 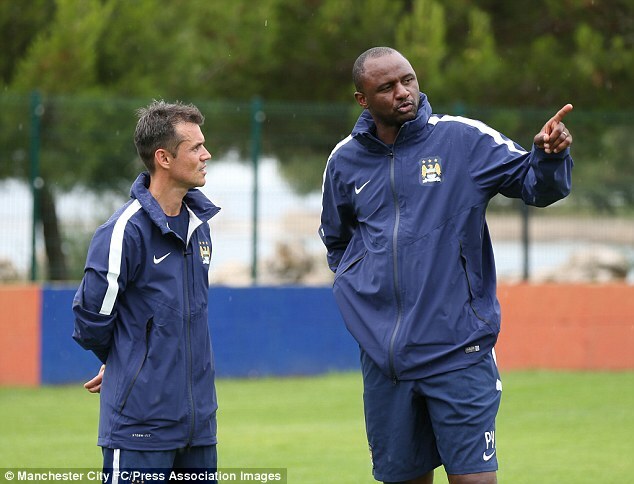 On this summer morning, it is a breathless training session in sticky, cloying conditions and Vieira has become irritated, noticing that his players have become attracted to the ball. ‘Stop, stop,’ he orders, his players freezing instantly. ‘Look at yourselves. Ten of you, all bunched together! How can you play like this? Look for the space, make the pitch bigger.’ He motions, spreading out his hands. 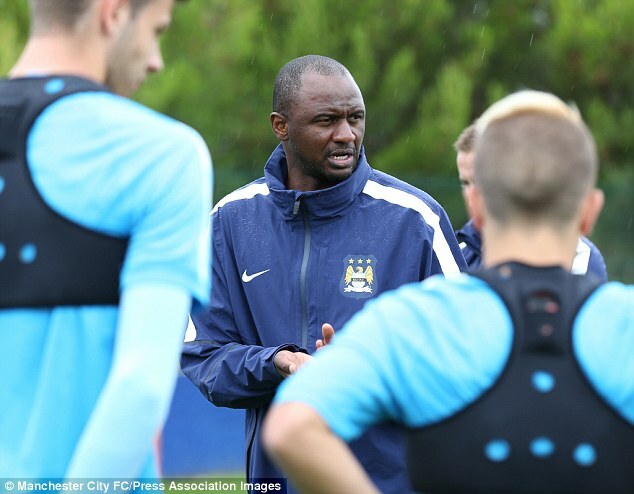 ‘The boys need to understand this,’ Vieira insists. ‘When you have the ball, the pitch must be as big as possible. If you lose it, make it as tight as possible and then seven seconds, maximum, to win it back. This, in a nutshell, is the club’s philosophy: an intoxicating brand of high-tempo, passing football that has been outlined by Allen, sporting director Txiki Begiristain and academy director Brian Marwood. It is the identity that City now encourage at all levels, from the Under-11 group to the first team under Manuel Pellegrini. Allen expands: ‘When I took the job four years ago I outlined a 10-year plan to really start to see a group of talent coming through together all playing the City way.